Patrick O'Brien was born in Ardmore on St. Patricks Day in 1844. He emigrated to Boston in his mid 20s (in 1869). Patrick is one of the post- Famine generation. 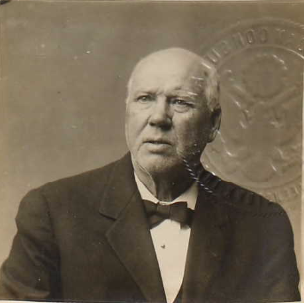 He became a naturalised citizen of the USA on the 28th October 1874 and he lived in Boston til 1913 when he returned to West Waterford, living in Dungarvan. He applied for an emergency passport in the summer of 1916 to return to Boston and his witness was a Reverend James Evard who knew Patrick for 1.5 years. Patrick is described in the passport application form as 5ft 8" in height and having blue eyes. No occupation is given in the application form, no doubt, at age of 72 he was retired from his trade.